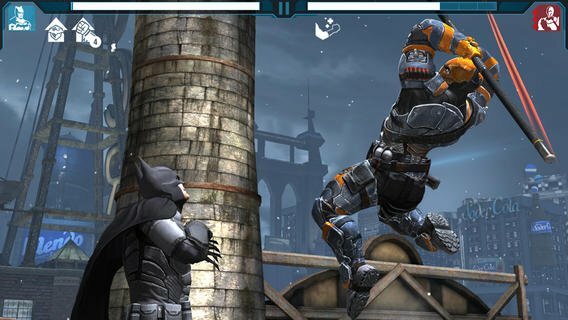 Batman: Arkham Origins, the mobile game inspired by the upcoming PC/console game of the same name, officially debuted today on iOS devices. The game can be downloaded through the App Store for no charge. The mobile Arkham Origins has the same basic premise as its PC/console counterpart. The crime boss Black Mask has put a bounty on the Dark Knight's head and multiple assassins are looking to collect. Batman will have to defeat assassins like Copperhead and Electrocutioner in one-on-one brawls. In between these boss fights, he'll pummel nameless henchmen. In battle, Batman can rely on difference skills and gadgets to best his opponents. He also has access to different stances, such as Assault and Guardian, that are suited to different playstyles. 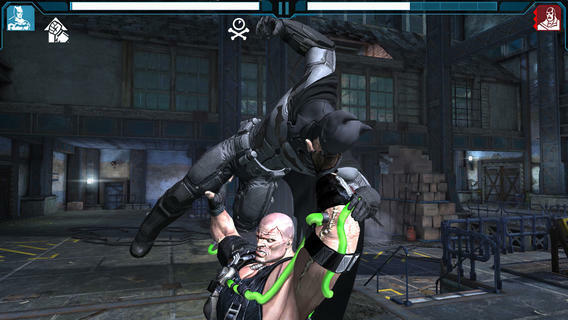 The players controls Batman in these duels by swiping or tapping the screen. As the player racks up victories, they'll unlock new content. There are over 15 alternate suits to wear and each has different health, speed and damage levels. The Batman Beyond and JSA Liberty Files suits are exclusively available in the mobile game. 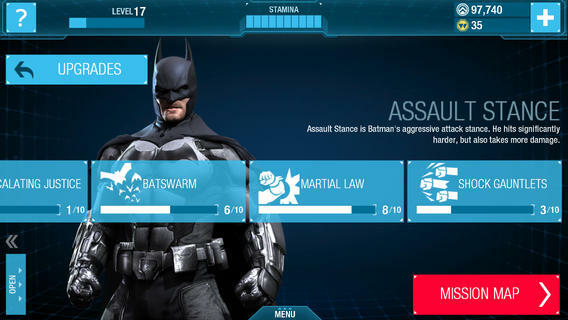 Players can also unlock over 250 skill upgrades to make Batman a more effective brawler. The game provides alternate ways of progression as well. By connecting the mobile game to your copy of the main Batman: Arkham Origins, you'll unlock exclusive content. Players can earn other bonus items by inviting their Facebook friends to play the mobile game. The game's in-game store also sells other benefits for real-world money, such as Dent's Lucky Silver Dollar for $2.99 and a WayneTech Bundle for $4.99. Presumably these premium items shorten the grind for unlocks. Warner Bros. subsidiary and Mortal Kombat creators NetherRealm Studios developed the mobile Origins game. The studio previously made the Batman: Arkham City Lockdown and Injustice: Gods Among Us for iOS as well. They're also making an Android version of Origins but the release date hasn't been announced yet. Arkham Origins will hit PS3, Xbox 360, Wii U and PC on October 25th. 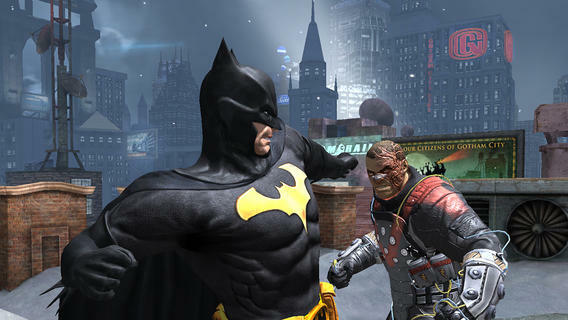 A separate handheld experience, Arkham Origins: Blackgate, is due on 3DS and PlayStation Vita on the same day.